Technically this is a crustless quiche, but the addition of flour makes for a delicious crusty bottom and sides. Technically this is a crustless quiche, but the addition of flour makes for a delicious crusty bottom and sides. In a large mixing bowl, whisk together eggs, flour, and baking powder. Whisk in milk, then stir in spinach-onion mixture. Pour quiche base into prepared pan. 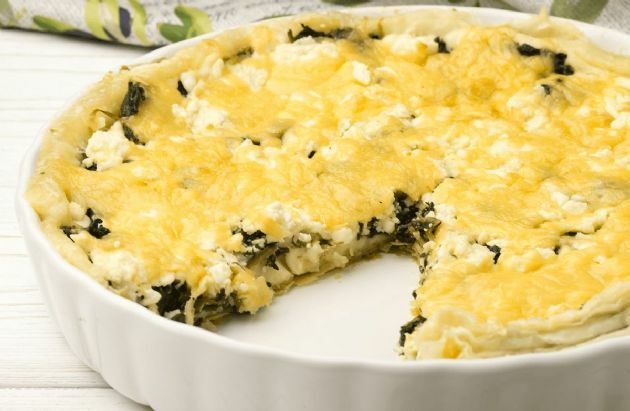 Top with feta cheese. Bake for 25 minutes, or until center is set and the outside edge is golden brown. Let set for 5 minutes, then slice and serve.